In residential circuits, power is generated at a very high voltage and is stepped down to 7200VAC by transformers located at substations throughout the distribution route. A distribution transformer located somewhere near your home steps down the voltage one last time to 240VAC. With a grounded, center-tapped transformer (with 0V at the center tap), the 240VAC is split into two separate 120VAC “hot legs”. The grounded, center-tapped wire of the secondary is called the neutral wire. The neutral wire serves as a current return path for both hot legs. 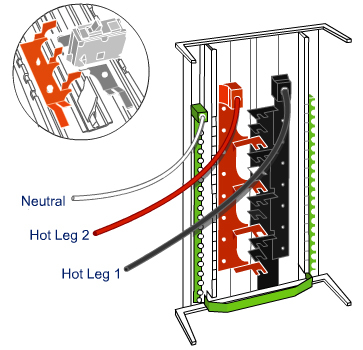 The hot legs, neutral and earth-grounded wire terminate at a service panel located in your home. The service panel provides a set of bus bars to allow for the insertion of circuit breakers, which protect each branch circuit from a current overload. A branch circuit consists of the house wiring that runs from a circuit breaker to the receptacles, lights, and other loads. For example, if a service panel has room for 24 circuit breakers, this would allow for 24 branch circuits. Each 120V branch circuit has its own circuit breaker, neutral wire, one hot leg, and a ground wire. A circuit breaker is rated by their current-carrying capability. To handle a typical residential lighting branch circuit, a 15A or 20A circuit breaker might be used. Likewise, an electric dryer might require a dedicated 50A circuit breaker. A circuit breaker is designed to trip (stop the flow of current through the branch circuit) when the amperage draw exceeds the circuit breaker’s rating. This is required since the wire that runs from the service panel will overheat if too much current flows through them. 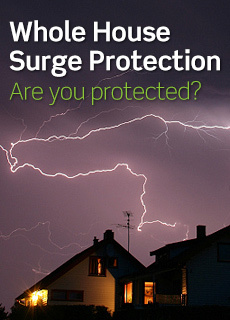 A circuit breaker protects against a sustained current overload and potential fire hazard.